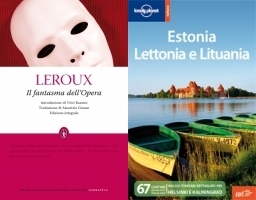 (Sto leggendo 2 libri in questo momento: "Il fantasma dell'Opera" di G.Leroux e la guida Lonely Planet "Estonia, Lettonia e Lituania", perchè sto cominciando ad organizzare il viaggio di due settimane che faremo quest'estate nelle meravigliose capitali baltiche (è tanto che desidero andarci! I have just finished reading "The strange case of Dr.Jekyll and Mr.Hyde" by R.L. Stevenson. I had read it at school in the original language, now I have re-read it for the challenge "The League of the Extraordinary Gentlemen"
(Ho appena finito di leggere "Lo strano caso del dottor Jekyll e del signor Hyde" di R.L. Stevenson. L'avevo letto ai tempi della scuola in lingua originale e l'ho riletto per la sfida "The League of the Extraordinary Gentlemen"). Very cool books! Thanks for stopping by my blog today!!! I loved The Phantom of the Opera. I have also seen it on Broadway too. Dracula is one of my favorites! Great picks! Wow. I love your book choices! Theu are all like classics! I really need to read more classics! Also the travel guide looks intriguing! Jave fun planning your trip and thanks for coming by LovelyLit! Our high school did a performance of Phantom of the Opera - they actually did Phantom of the "soap" opera! You are so lucky to be able to go to the Baltic States. Whereabouts do you particularly want to visit? Does one country appeal to you more than the others? We'll surely visit Vilnius, Riga and Tallin plus Trakai (near Vilnius), Jurmala (a beach near Riga) and Helsinki in Filand whan we'll be in Tallin (there are only about 2 hours between the two cities by ferries). I love the Lonely Planet Guide Books. They have things in them most people never see. Excellent! Great classics! It's been awhile since I've read Dracula. I should dig it out and re-read it. I'm signed up for the League Challenge, too, but still haven't started reading the books, but you seem to be on a roll ;) Happy reading!!! 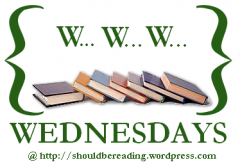 Wonderful classic reads! Have you read Frankenstein? I just read it a few years ago and was amazed at how different it was from all of the movies that have been made. Loved that book! Thanks for stopping by The Book Bag. Your upcoming trip sounds wonderful! Thanks for stopping by my blog yesterday.